The farms around Waterford began basically as subsistence operations. Once the fields were cleared the size and layout of area farms remained essentially unchanged. Parcels might be accumulated in the lifetime of one individual only to once again be split up by his heirs. But the most remarkable feature of the Waterford landscape is that the field patterns are virtually unchanged since the onset of mechanized farming in the late 1940's. Comparison of aerial photographs taken in the 1930's and those taken fifty years later show only minor changes in hedgerows, roads, and structures. 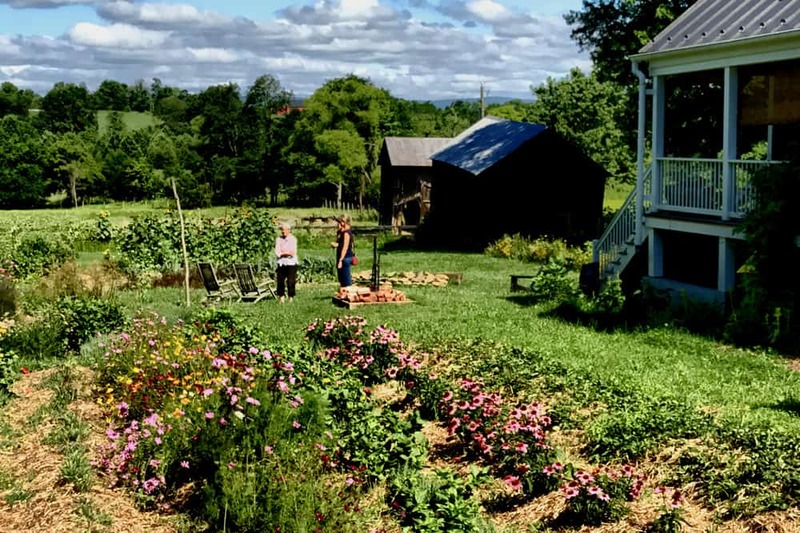 According to the Loudoun county Agricultural Census of 1982, there were 888 farms in the county; 191,000 acres (57% of the county land) was then under cultivation or related agricultural activity, while another 30 percent of the county's land was forested. New demands have expanded the traditional corn, wheat, and hay production to include fresh produce. Dairy farms were steadily diminishing: the county lists only 23 in 1989, with the Waterford area having only one. Yet, the relationship of village and fields remains essentially unchanged. 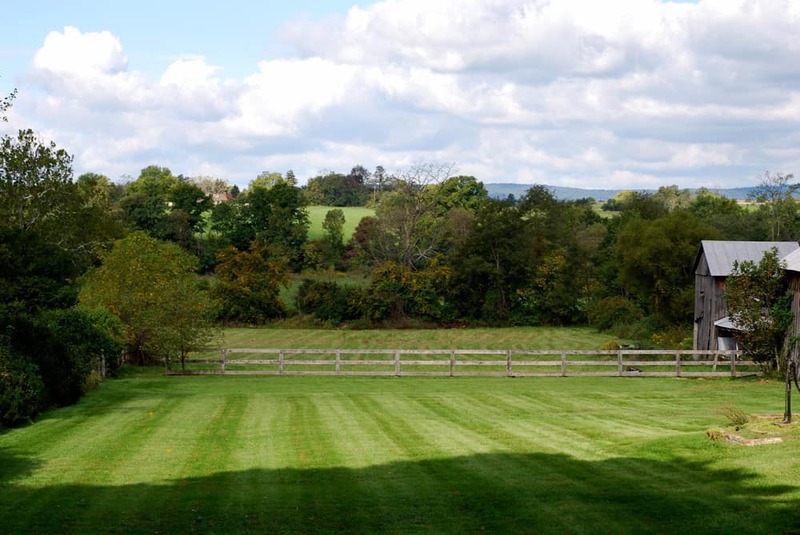 The 19th century growth pattern of towns and villages of the mid-Atlantic has been frozen in time in Waterford, and is embodied in the town lots, the architecture and the surrounding field patterns. Virginia was established through the tobacco trade, but by the first decade of the eighteenth century that trade was at a low ebb following Queen Anne's wars and the loss of the European market. As settlements spread further inland, it was more difficult to "roll" the huge hogsheads of tobacco to market or at least to water transportation. The necessity of grain cultivation was recognized to ensure the food resources of the colony. Flour was a more easily transported commodity, and the new settlers who migrated to Virginia from Pennsylvania arrived with experience not in tobacco farming, but in a diversified agriculture based on grain. "Loudoun and upper Fauquier, seated at the very time the new influence began to be felt, became grain producing communities from the first turning of their soil" (Harrison, p. 401). By 1745, Virginia was exporting enough wheat in the form of flour that contemporary laws called for the inspection of flour. With a succession of bad tobacco seasons, additional taxes, and the activity of French privateers around mid-century and the increasing demand for American wheat in England, many northern Virginia planters were encouraged to diversify. In the third quarter of the eighteenth century as the staple crop began changing from tobacco to wheat, most planters in Virginia were still utilizing the same wasteful system of old fields. A German traveler describes in his journal the wasteful, "lazy man's agriculture" as practiced by Virginians who neglected to utilize cattle dung and deep plowing (Harrison, p. 114). George Washington himself describes the wearing out of fields from successive planting of Indian corn and wheat with no grasses being sown (Harrison, p. 270). In the late 1700s, John Binns of Waterford found that exhausted land was replenished with the application of "land plaster" and manure. This technology spread through the Quaker community to Waterford. Land plaster was calcium sulfate, imported from Nova Scotia and ground into a fine powder at the local mill. Before the Civil War, the imported lime was replaced by "burnt lime," the process which turned limestone (calcium carbonate) into unslaked lime (calcium oxide) (A.M. Janney, p. 30). Through the 19th century wheat, corn and livestock were the basis of Waterford agriculture. Most of the barns in the area were built during the first half of the century in order to accommodate grain storage, machinery and livestock as the farm operations became increasingly geared to commercial rather than subsistence value. By the end of the century, dairying had also become a part of this commercial equation as silage and the railroad allowed year round delivery of fluid milk to regional markets. Currently, wheat production has all but vanished from the area between the hills, and the emphasis is placed on cultivation of corn and hay to accommodate beef cattle, horses, sheep and dairy cows. While the average holding of 150 - 200 acres was considered to be the optimum size for the operation of a subsistence level farm during the 18th and 19th century, a farmer who held over 500 acres was considered wealthy. John Compher who owned property on the northwestern outskirts of Waterford would have been a relatively large landowner for post-war western Loudoun County. Among the property left to his four daughters are separate farms of 200, 171, and 161 acres (Loudoun County Will Book 3S, f. 191). His father, Peter Compher also left considerable property including a number of slaves. An operation of that size must necessarily rely on slave or hired help. It was not until the general adoption of mechanized equipment following World War II that larger holdings were feasible. Through the first two-thirds of the eighteenth century, many farmers stored the relatively small grain harvests in their attics. In response to a growing transportation network and the development of urban markets, more land was cleared and more grain grown beyond that needed for household consumption or storage capacity. The practice of purchasing livestock from drovers from the expanding frontier and then fattening them for market demanded better care and control over feed and breeding. Therefore, barns were often added to the farmstead after the dwelling place. John Jay Janney describes the operation of the typical farm in the first decades of the 19th century "...The farms were worked by the owner and his sons with the aid of a 'bound boy,' and a hired man or more if needed in the summer" (p. 68). Earlier he describes his family's farm as staffed by an uncle, a hired hand, and an "idiot" ward who had been taken in from the poor house (p. 40). Solange Strong suggests that the model plan for most Quaker and German stone houses was directly influenced by William Penn's instructions for building a proper first house. Penn in turn may have been influenced by the Swedish cabins which had been built in the Delaware Valley, like the Pennsylvania Bam, another example of the pragmatic adaptation of a building form from another culture which had proved to be useful for New World life. The small rooms, low ceilings, enclosed stairs, batten doors, and fireplace for cooking were economical of both material and labor for building and fuel for heating (Strong, p. 18). floors were bare and scoured with sand. Board fences and gates surrounding the house were whitewashed as were the walls "below stairs" (J.J. Janney,p. 70). 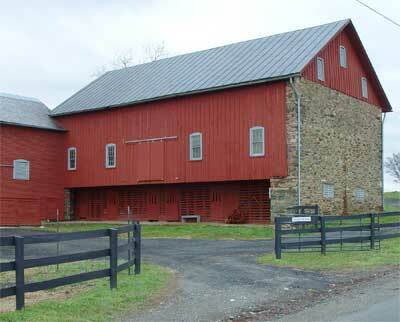 The typical barn of the Waterford area shows a distinct Pennsylvania influence. The most distinguishing feature is the cantilevered projection of the second floor 6 feet or more over the front of the stable or foundation level. This wooden forebay sheltered livestock from high sun and precipitation and would have provided protection from both snow and straw accumulation in front of the stable doors. As the orientation of the bay is to the south or southeast, the overhang allows the warming of the early and late winter sun within the stable area while protecting the interior from the high summer sun. The foundation level is built of fieldstone, banked into a slope which typically rises to the rear, providing a stable area for livestock. The second level is divided into three bays, accommodating hayloft, granary, threshing floor, and space for equipment storage, and is accessed through double doors reached by the ramp created from the bank at the rear. Gravity simplified feeding of the livestock below. Although a matter of speculation, the source of the forebay barn is believed to be central and eastern Switzerland. Whatever its origin, this quickly became the universal style of barn building among Germans and non-Germans alike of southeastern Pennsylvania. Although existing barns in Waterford post-date settlement by half a century or more, they show the continued influence of the Pennsylvania culture on the area. Age determination of barns by appearance is especially difficult due to the longevity of styles and the propensity of thrifty farmers on an established farm to recycle materials and rebuild fire-, decay- or war-damaged barns on existing foundations. Most pre-Revolutionary barns were built of hand hewn logs. Later versions were usually frame (90% of those surveyed by Glass, p. 66). Stone versions of Pennsylvania barns are also seen in some areas, including western Loudoun, and were most popular during the first half of the 19th century. Many Loudoun County barns were destroyed in the Burning Raid of 1864. 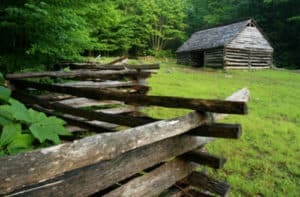 Barns and spring houses were set relatively close to the dwelling as there was often no slave labor to fetch and carry. Even so, as the house was usually situated on higher ground, the spring house was rarely less than 100 yards away. With a fireplace of stone Example of an existing forebay barn off Route 665. built nearby, this structure also served as milk house, wash house, and for cheese making (J.J. Janney, p. 67). Janney describes another use of the spring house when a salt-cured fish might be placed in the drain "...where a stream of fresh water would run over it all night, and in the morning it would be nearly fresh" (p. 29). Other outbuildings commonly found on the self-sufficient farms of the early 19th century include the necessary house, ice house, smoke house, wagon shed, butchering shed, and outdoor ovens, of which a few examples exist scattered within and around Waterford. Silos were not added to farms until the end of the nineteenth century. The ceramic style is particularly distinctive of the area and probably originated in Buckeystown, Maryland. In addition to the livestock and crops grown, the working farm grew its own fruit and vegetables. Preserves were made from fruits including quince, peach, cherries, plums, and watermelon. The dooryard garden of Janney's boyhood home contained quince bushes for preserves, several damson plum trees for fruit and preserves, and rows of currant bushes for pies, jelly, and currant wine for sickness and special occasions (J.J. Janney, p. 46). Potatoes, beets, turnips, parsnips, and cabbages were all grown and eaten as vegetables, but not raw. Green beans and cucumbers were grown for pickling. They also grew yellow and white corn "...with small, round hard grains and a big cob, such as farmers will not plant at all now" (J.J. Janney, p. 35). Asparagus and sweet potatoes were also included in the garden, but not as food (J.J. Janney, p. 49). A variety of herbs was produced at home including those used for general cooking, flavoring, and scenting purposes, as well as many which were credited with medicinal properties. "Every" garden had a hop vine in it, from which yeast was made from the fermented hops: "compressed yeast" was not available commercially, baking powder not yet invented, and "salt rising" was not popular (J.J. Janney, p. 23). Flowers, too, would have had a place in an early 19th century garden even in, or perhaps because of, the relatively isolated location. Janney lists white lilies, pinks, marigolds, bachelor's button, cockscomb, nasturtium, cabbage rose, Rose of Sharon, and chrysanthemum as being included in the garden of his home place (J.J. Janney, p.49). At the beginning of the nineteenth century, most of the diversified farms kept a variety of livestock, some for market and some for the family's own use. Horses were of course not only valuable for the labor they provided on the farm, but were the only transportation other than one's own feet. Horses were stabled as resources permitted. Cows and steers were pastured in the summer, and kept in the barnyard in winter where they could shelter themselves under the overhang of the forebay barn. By the first quarter of the 19th century, cattle were driven in from Indiana or Illinois in the fall and sold to local farmers who kept them in fall and winter pasture. The farmer of this day did not specialize and therefore did not keep large herds of cattle. The lists of Loudoun County tithables from mid-century show that six to ten cattle was a good-sized herd for the average farmer who held 150-200 acres. 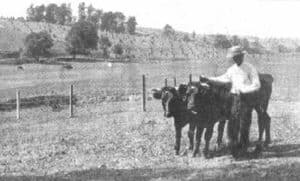 The larger landholders, such as Ebenezer Grubb or Peter Compher, had as many as twenty or thirty cattle, but they also held more land, needed more labor, and were more likely to have held slaves. The Quaker farm families ate little fresh meat, usually the remainder of butchering for market or preserved meat for home use --hogshead cheese, sausage, and pigs' feet. Once a year a steer or old cow was butchered and consumed on the farm. Salt meat or fish was the daily fare in summer. Poultry was more plentiful though as J. J. Janney states, "We made free use of chickens" (p. 29). Hogs were fed twice a day or rooted in the woods, and "slept where they could" (J.J. Janney, p. 79). Sheep were fed twice daily, but stayed in the field. Around Christmas the hogs were butchered, stuck and left hanging overnight, and taken to market in Alexandria or Georgetown the next day. The return trip netted a year's supply of salt, "common New Orleans sugar," and oysters. Chickens were kept around and given free range in wheat stacks, straw piles, or on outbuildings. A small flock of geese provided quills for writing and feathers for bedding, but were not common on local tables. Many of the farms also kept a small flock of turkeys, which were driven to market for sale. "A few weeks before Christmas we put about a dozen geese in a pen with running water through it and fattened them, and sent them to market with the hogs" (J.J. Janney, p. 80). Well into the 20th century most major farm holdings also included remote wood lots of 10-40 acres often on Catoctin Mountain or "lying in Catoctin Creek" (Will of Peter Compher). Cutting of wood for fuel, lumber, and fencing was part of ordinary farming operations. Janney remembers that wood was cut from the "...down and dead trees" after the harvesting and seeding in the fall (p. 73). By the middle of the 19th century, Yardley Taylor observed that "The probability of an abundant supply of Coal for fuel, has induced the belief that it is not necessary to retain so large a portion of timber land, for fuel and fencing, as was formerly supposed" (Taylor, p. 25). Whether the Civil War and the hard times that followed or the relative unsuitability of the land for other purposes was the cause, many farms held on to their woodlots. In his memoir of 1853, Yardley Taylor cites the lack of large trees in the county and attributes that to the pre-settlement practice of burning the fields for easier hunting (Taylor, p. 22). Indeed, the early deeds are full of references to "poison fields," the open areas left by burning. Nicholas Cresswell makes reference to planted trees in the area around Leesburg in a journal entry, Friday, March 31st, 1775: "The Peach Orchards are in full blossom and make a beautiful appearance" (p. 60). In the early spring of 1777, Cresswell describes seeing sugar made from the sap of the sugar maple on the farm of "Captain Douglas" near Leesburg (p. 188). Whether this was a regular practice or necessity due to the war is unclear. Forty-five years later, Janney recalls having a seven-acre apple orchard on a farm of 263 acres. "During the fall and winter we had apples in plenty" (J.J. Janney, p. 37). Pear trees were rare according to Janney's memories, and through the end of the 19th century farmers were still having trouble with them according to the records from the Catoctin Farmers' Club. 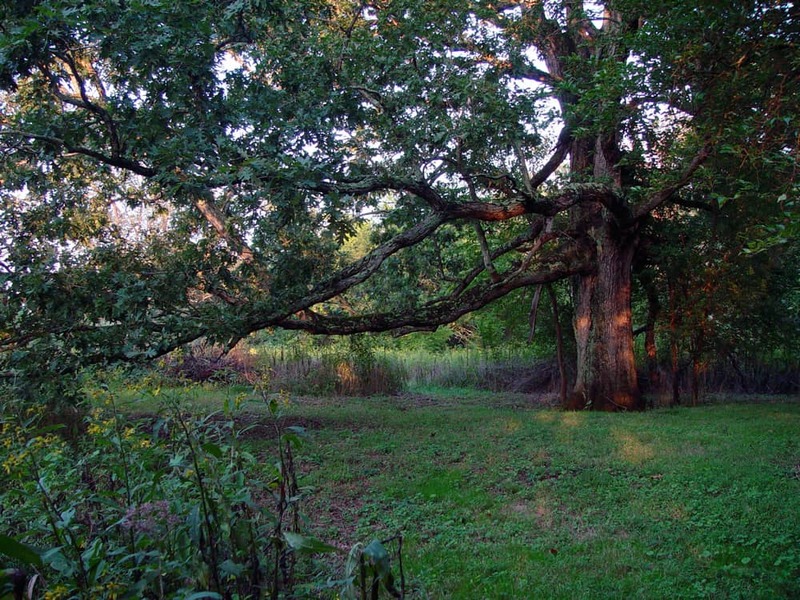 The mature trees that exist today in the village provide living documentation of the types of trees that were planted or grew naturally in the past. An inventory of existing trees in the village indicated that the predominant street trees are maples, either silver or red, most dating from the late 19th century. This inventory is consistent with photographs of the village circa 1900 which show the existence of relatively young maples along Waterford's streets. There are a small number of sugar maples existing in the village in various stages of decline, with six to seven foot diameter trunks, dating pre-1900. We can speculate that since there was a history of planting sugar maples for sugaring in the area, these may have been planted in the village for that purpose. The other prominent tree in the village landscape is the Sycamore (Platanus occidentalis). Trees of this species are found along the bottomland of the Catoctin Creek, frequently throughout the farmland and occasionally in the village. Janney says fences were nearly all of the "worm" variety - also called horse and rider fences (J.J. Janney, p. 68). The fence rows provided space for various fruit and nut trees. According to Janney, "the peach trees grew along the fence rows (some of them planted, but nearly all volunteers), and in or by old stumps in the fields" (J.J. Janney, p. 39). Hazelnuts and blackberries, too, were gathered from the assorted vegetation that made up the fence rows. Examination of two sets of aerial photographs take in the late 1930's and mid 1980's show that field patterns have remained remarkably consistent. With the exception of two small areas that were allowed to become reforested and the construction of a handful of new houses, there was virtually no change to the field patterns in an area covering thousands of acres. As the photos were taken at different times of the year, it's possible that the proportion of crops planted has changed, but a shift in the distribution of crops within the established fields would be a continuation of the early practice of annual crop rotation. Fencing material has certainly been added or replaced through the years as that now existing represents a history of the evolution of barbed and box wire, but the there is little reason to believe that the plant material represented there has changed significantly over the years. An assortment of native trees, shrubs, and vines is still allowed to spring up and grow along fence rows that have not been changed since the introduction of machinery to farming, and therefore has probably not been substantially changed since settlement.